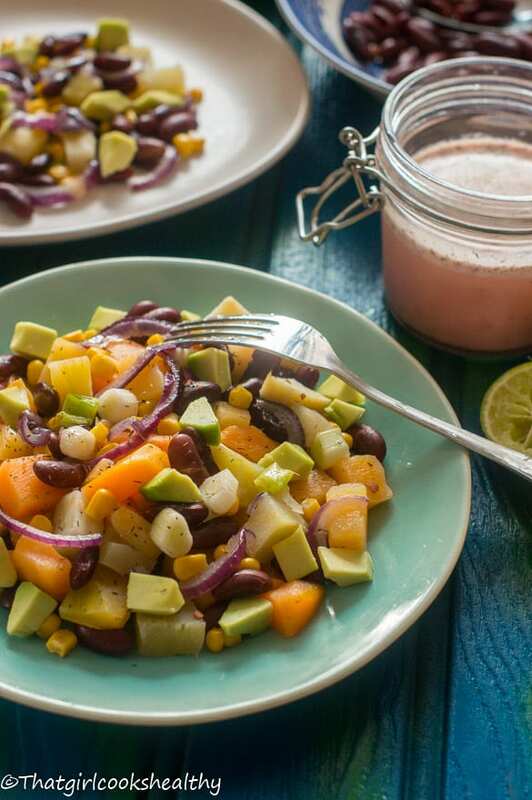 High Protein enriched healthy Caribbean style kidney bean cassava salad topped with sweet lime dressing. The ultimate weight loss food. As we transition smoothly into the cooler months I have a tendency to reflect on the warmer months and prepare myself for the harsh winter season. Summer, as always, was great for all things light – lots of popsicles, smoothies and of course salads. 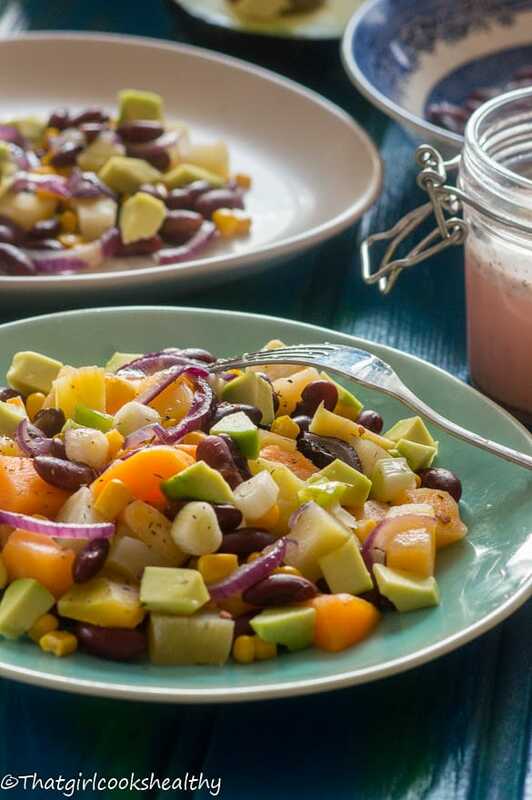 I guess you could say that this salad recipe is to bid farewell to summer..so long…farewell *sniff* *sniff*. Granted salads can be eaten all year round BUT…….we as a nation like to overindulge in them more often then not during the summer time. This high protein salad as a slight tropical to feel to it, as you may have already noticed I opted for some cassava known as yucca to the latino community and butternut squash rather then use the typical greens – lettuce etc..These root vegetables are a great source of vitamin C by the way! By adding the squash and cassava this made the salad slightly more carbohydrate dense but not over excessive. 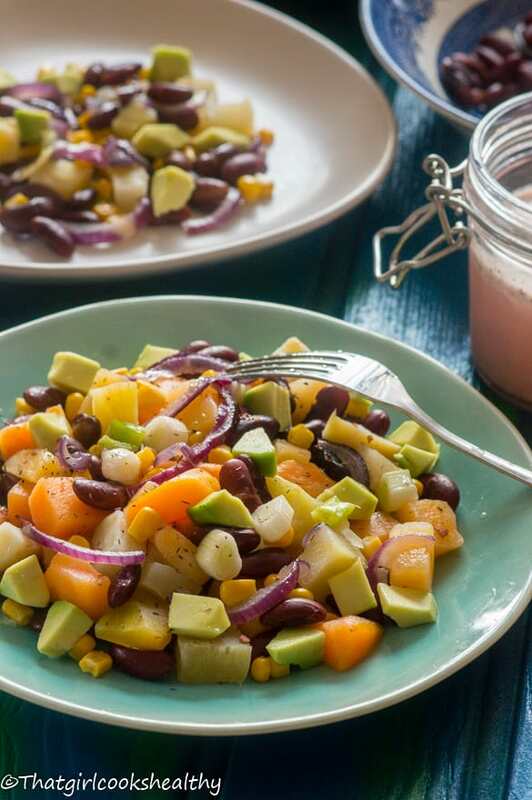 Here we have a healthy portion of fats from the sweet lime dressing (extra virgin olive olive) protein from the red kidney beans and carbs from the veggies and starch enriched ground provisions. 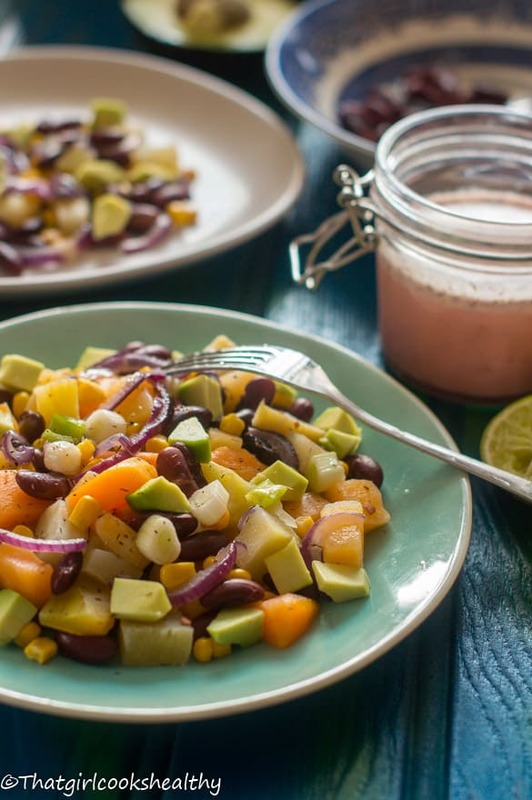 This a great dish to sustain your body throughout a busy day, for example if you’re looking for something that has an equal balance of protein, carbs and healthy fats then this would be ideal as it offers the aforementioned. It is important to note that the body needs a healthy balance of macro and micro nutrients in order to function probably. I know many peopl like to shy away from salads in fear of the fatty dressing. Listen up on a second, omega fats won’t make you gain a drastic amount of weight, rather it will lower your body’s bad cholesterol levels. Most of the flavour will come from the dressing as the ingredients that make up the salad are bland. On the contrary, the dressing is the star of the show, adding all the sweet sun kissed flavour that you need. I’ve instructed which ingredient needs to be parboiled down below – cassava and the squash. The red kidney beans are readily available in a tin to use at your discretion. Prepare the dressing by adding all of ingredients together in a blender and blitz into a smooth consistency and set aside. Arrange all of the ingredients for the salad on a serving dish, make sure the cassava and squash and completely cool. Once everything is on a dish then feel free to pour a generous amount of dressing onto the protein enriched salad. This is so great! Thank you for sharing the recipe! Very healthy looking salad. Transfers beautifully from Summer to Fall. What a wonderful salad, and that dressing is a keeper! This is great! I keep seeing yuca at the store and wondering what to do with it. You can do so much with it. It’s used a lot in Caribbean and Latino recipes. More recently the paleo crowd have started to embrace it – boil it, make it into fries, cassava mash, bread the list goes on.